A still shot from the website glittering.blue shows a snippet of the looping video that shows one day on Earth. 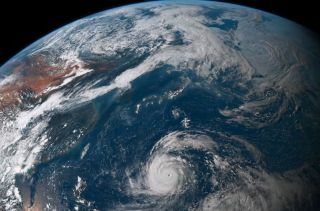 The image was captured by the Himawari-8 Japanese weather satellite. Please direct your attention to the absolutely magical video of planet Earth from space. Like cats with a sparkly toy, we here at Space.com have been unable to pull our gazes away from this stunning website, glittering.blue. The site plays a looping video of a 24-hour period captured by the Himawari-8 Japanese weather satellite, sped up to last just a few seconds. The satellite is in a geostationary orbit, positioned over Japan and Australia. The video captures an array of stunning colors, such as the reddish-brown and green landscapes, the blue hues of the ocean, as well as textures (look at those clouds!) that aren't always visible in satellite images. The flowing motion of the clouds and the ocean currents and the swirling of a tropical storm are totally hypnotizing. At this point, there are probably millions of photographs of the Earth taken from space, but few are ever made available in a format where viewers can see details on the surface in such high resolution, at such a large size. There's a lot more information about the satellite and its capabilities on the website's About page, which is a fascinating read for whenever you manage to stop staring at the video. It also answers questions like why there are no city lights visible in the nighttime portion of the movie, and provides information about some of the features on the planet. The site was created by Charlie Loyd, a satellite imagery analyst for a company called Mapbox. Loyd gave a long interview to The Atlantic about the project. The video is rather large, and some people have had trouble getting it to load. Unfortunately we can't make any recommendations other than trying it on a better internet connection. If you're looking for a wonderful way to end your Friday, we'd recommend this glittering gem.